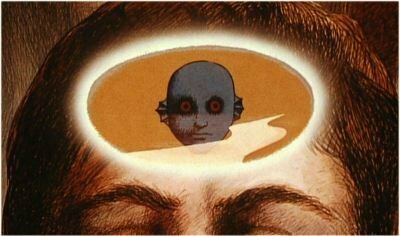 It's fairly obscure outside of select animation circles, but that doesn't mean René Laloux's Fantastic Planet (AKA La Planète Sauvage, or "The Savage Planet") isn't worth a look. This oddly compelling 1973 animated effort has certainly aged in some regards, though its creative visuals and twisted storyline help maintain a solid balance. Those who like their sci-fi abstract and obtuse have certainly come to the right place; everyone else, however, may feel more than a bit estranged by what unfolds in just 73 minutes. Translation: it's pretty trippy. Our story revolves around the human-like Om people and their strange relationship with the Traags, a race of giant blue creatures who inexplicably speak perfect French. These curious beings have mixed feelings about the smaller Oms: most adult Traags regard them as vermin, but the younger creatures enjoy keeping them as pets. Careless play sessions often injure or humiliate the Oms, whether their large owners are batting them around or pitting their pets against one another. It's established early on that this one-sided relationship is akin to a selfish child toying with ants or teasing a small kitten; though some Traags mean well, it's essentially "us versus them". It's appropriate, then, that their relationship doesn't last long. 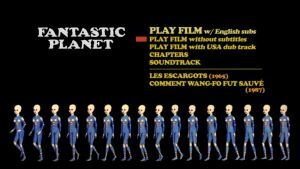 More than anything else, Fantastic Planet is a tale of revolt, rebellion and attempted escape. Our protagonist is Terr, a young boy who we follow from an early age. During learning sessions with his owner Tiva, he secretly gains the knowledge she's currently "downloading" (for lack of a better term), but he's initially unsure of what to do with this valuable info. Oms are generally kept completely in the dark, so Terr holds a rare advantage; eventually, he's accepted into a wild tribe that wishes to escape. The ensuing attempts don't come without violence and death, however. 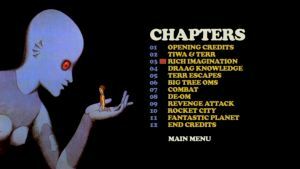 The storybook animation style is perhaps the most striking aspect of Fantastic Planet, which resembles Terry Gilliam's animation for Monty Python. The soft characters are punctuated by bold hatching strokes, creating a visually firm but stiff appearance. This pairs well with the film's score, a pure product of the 1970s---and though it certainly shows its age during several sequences, this often adds to the film's densely disarming atmosphere. The story is deliberately paced but can't help but drag in a few spots, creating a final product that many viewers may find a bit dry. Those new to Fantastic Planet may want to proceed with caution, but those who know and appreciate the story should enjoy Masters of Cinema's new DVD package. Originally available in Region 1 as an out-of-print, cropped disc by Anchor Bay, this offers a decent improvement in the technical department and a few nice extras. It's hardly a well-rounded package, but it's undoubtedly the best we'll get for some time. Let's take a closer look, shall we? Presented in its original 1.66:1 anamorphic widescreen and enhanced for 16x9 displays, Fantastic Planet looks good but not excellent. This is still the best it's ever looked on DVD, at least for Region 1 viewers: Anchor Bay's previously-released disc was a 1.33:1 pan-and-scan job with forced subtitles, so the image had nowhere to go but up. This time around, the film's surreal color palette looks bold and natural, while black levels are generally solid from start to finish. Dirt and debris are on display during several sequences, while scenes of action are blurred by mild digital combing. It's a decent effort overall, but the lackluster source material keeps this from scoring higher. On the audio front, two separate Dolby Digital tracks are included: the original French and an optional English dub. The dub sounds a bid crisper and more refined in comparison, though both seem a bit thin on the whole. Dialogue is generally clear and easy to understand, while optional English subtitles are available during the main feature (subs are also present during the extras, but they're burned in). This isn't the cleanest audio presentation you'll ever hear, but at least we're not stuck with a gimmicky remix. Seen above, the animated menu designs are simple and easy to navigate (with one exception, mentioned below). The 72-minute main feature has been divided into 12 chapters, while no obvious layer change was detected during playback. This one-disc release is housed in a clear keepcase and includes a 40-page booklet filled with plenty of production artwork and an essay by Craig Keller. The first and only film-related extra is Fantastic Planet's complete Soundtrack (25 tracks total), though its presentation proves to be a bit frustrating. Those hoping for a separate disc will be disappointed, as these tracks are listed single file on two sub-menus cursed with clumsy, stiff navigation. The sound quality is relatively strong and full-bodied, but this soundtrack would've made more sense as a stand-alone CD or DVD-audio disc. Aside from this, we're also treated to a pair of Short Films by the director: "Les Escargots" ("The Snails", 10:43) and "Comment Wang-Fo fut Sauvé" ("How Wang-Fo Was Saved", 14:55). These shorter productions---produced in 1965 and 1987, respectively---bear little resemblance to the main feature, though a few visuals are slightly similar. "Les Escargots" tells the story of a farmer whose depleted crop is curiously revived by the farmer's own tears. He subjects himself to an amusing assortment of ways to keep the tears flowing, though a gang of giant snails doesn't help matters any. "Comment Wang-Fo fut Sauvé" is much different in tone and employs a more traditional animation style. This soft-spoken narrative is based on a Chinese folk tale, but the production is carried by the visuals. Both French shorts are presented in their original 1.33:1 aspect ratios and include forced English subtitles. The transfer quality is hardly perfect by any stretch, but it's nice to have these rarities in watchable condition. It's certainly not a film for all tastes, but those who enjoy animation with a healthy dose of abstract sci-fi should find Fantastic Planet worth a look. It hasn't aged well in certain areas, but the oddly compelling story and unique visuals help to keep things afloat. The DVD by Masters of Cinema does what it can with limited source material, though the technical presentation and bonus features aren't exactly revelatory. Here's the bottom line: those who own previous versions should find this upgrade worth the money. For everyone else, it's an interesting film...but the polarizing Fantastic Planet isn't exactly blind buy material. Rent It first.